LG OLED TV 55" 4k webOS3.0 Smart HDR OLED TV HDR Price $2499.99, Laptop Ace Intel Core i5-7200U Processor after savings $569.99, GoPro $399.99 save $37, Wireless HD Smart Home scurity system 4-Camera Kit price $469.99, UFile 4 price $18.99 save $3, Beats by are Solo 3 bluetooth headphones price $249.99, We'll beat any price. 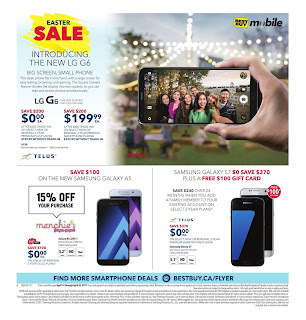 Online or anywhere else. 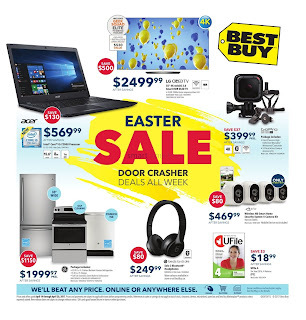 Easter Sale Door crasher deals all week check online at BestBuy.ca for holidays store hours, Toshiba LED TV 50" 1080 P price $399.99 after savings save $150, LG 49" webOs 3.0 smart HDR IPS LED TV price after savings $799.99, Laptop ASUS Intel Pentium PRocessor 14" 8 GB, 1 TB after savings price $499.99 save $150, you can chek for detail on page 2.